Depending on their location or shape, some seams require additional steps, other than pressing, to give them the desired professional look. When doing any of these techniques, consider the fabric type carefully. One that doesn’t ravel can be trimmed closer to the seam line than one that does ravel. Keep clipping or notching to a minimum on loosely woven fabric, and remember, the thicker the fabric, the greater the need to reduce bulk at the seams. Trimming (1) means cutting away some of the seam allowance. It is done when the full width of the seam allowance would interfere with the fit (as in an armhole). Seams are first trimmed to half their width before grading. Grading (2) (also called layering) is the cutting of seam allowances to different widths, as shown above, with the seam allowance that will fall nearest the garment side cut the widest. To trim a corner (3) of an enclosed seam, first trim the seam allowances across the point close to the stitching, then taper them on either side. The more elongated the point, the farther back the seam allowance should be trimmed, so that when the point is turned, there is no danger of seam allowances over-lapping and causing bulk. Care should be taken not to cut into the seams while trimming corners. Clipping and notching are used on curved seams to allow them to lie smooth. 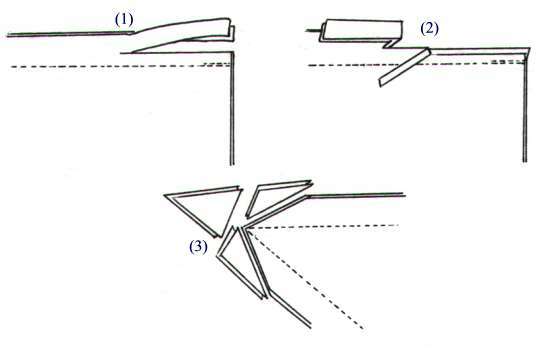 Clips (Fig A) are slits cut into the seam allowance of convex, or outward curves that permit the edges to spread. Be careful to hold the scissor points just short of the seam line to avoid cutting past the stitching. 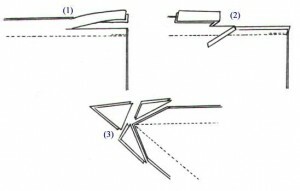 Notches (Fig B) are wedges cut from seam allowance of concave, or inward curves. Space is opened by the removal of the fabric letting the edge draw in. 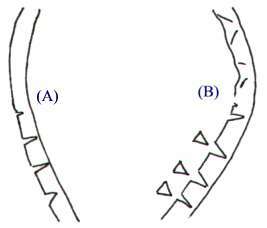 When clips and notches face one another, as in a princess seam, they should be staggered to avoid weakening the seam. As stated previously, be careful when making the notches so you don’t cut through the stitching line.